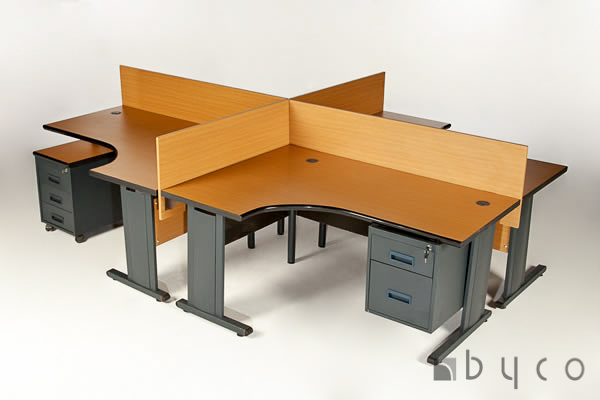 Collaborative desks or workstations are great for open office environments where staff members work as teams. They also offer the advantage of making the most of your space and in large rooms partition walls can be utilized to create space for teams to work and offer a sound barrier between each team for privacy. 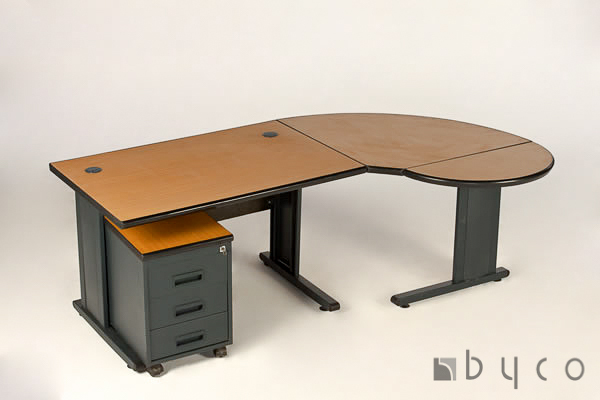 Most collaboration workstations are big enough for groups of 2 to 4 people and are configured with straight or L-Shaped desks or tables. These workstations allow staff to work as a group while still offering privacy between each person by means of partition panels between the desks. These workstations commonly have one or two sets of drawers for storage and adequate workspace for paper flow, computer monitors, keyboard, mouse and laptop. In some instances monitor arms may be mounted on the desk to provide additional workspace and improve ergonomics of the workstation. Desk pods can be created with many different styles of desks, you are not limited to any single manufacturer as creating the group is done by clustering the workstations into a pack. These packs can be arranged to form teams throughout your business and collaboration on projects based on the industry your business is in. Both open collaboration workstations and cubicles have their place in businesses. Depending on the industry or nature of your business, one may be a better option than the other. In most businesses, a blend between collaboration workstations and cubicles is best as some staff members require more privacy than others.